The colophon contains the “facts of production” — the fonts, paper used and printing method — for the book and is part of the back matter (usually the last page of a book). Generally, colophons are only included in “specially designed and produced books.” We include a colophon in emerge, to honour the tradition of book publishing. We think these facts of production humanize the book and show the reader how and by whom the book was produced. The last page of a specially designed and produced book occasionally contains a colophon—an inscription including the facts of production. Click here for the Chicago Manual of Style online. 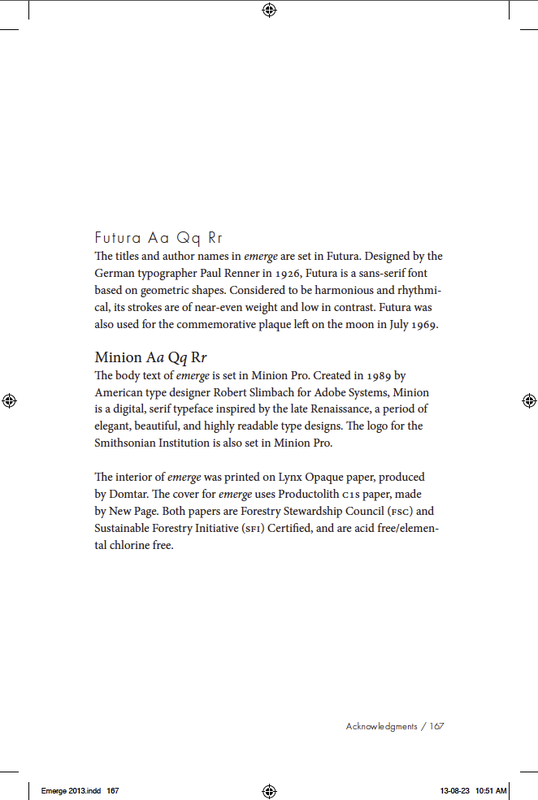 The titles and author names in emerge are set in Futura. Designed by the German typographer Paul Renner in 1926, Futura is a sans-serif font based on geometric shapes. Considered to be harmonious and rhythmical, its strokes are of near-even weight and low in contrast. Futura was also used for the commemorative plaque left on the moon in July 1969. The body text of emerge is set in Minion Pro. Created in 1989 by American type designer Robert Slimbach for Adobe Systems, Minion is a digital, serif typeface inspired by the late Renaissance, a period of elegant, beautiful, and highly readable type designs. The logo for the Smithsonian Institution is also set in Minion Pro. The interior of emerge was printed on Lynx Opaque paper, produced by Domtar. The cover for emerge uses Productolith c1s paper, made by New Page. Both papers are Forestry Stewardship Council (fsc) and Sustainable Forestry Initiative (sfi) Certified, and are acid free/elemental chlorine free.